There are lots of rats in street art from Banksy’s rats to Blek le Rat but this is a new rat on the streets. The city as a rat race (see Wikipedia’s disambiguation) is the theme of the “Chazov-Dmytryk-Harkov deductive logic test” by CDH. It exists somewhere between a puzzle, a walk and a series of poster sized paste-ups. It is not a complex game, just as series of puzzle steps to a solution, but playing on the grid of Melbourne’s streets and lanes is a novel approach. This is a different use for paste-ups, sign posting a conceptual interactive puzzle walk through the rat race of the city. My legs are still aching from walking the route around Melbourne but I had fun solving the “Chazov-Dmytryk-Harkov puzzle. The centre of Melbourne has a lot of hills (Terry, the postman with a Collins St. route, nods in tired agreement) and I have been up several of them today. The “Chazov-Dmytryk-Harkov” puzzle builds up a vocabulary of increasing complexity using the same map of the city and symbols. 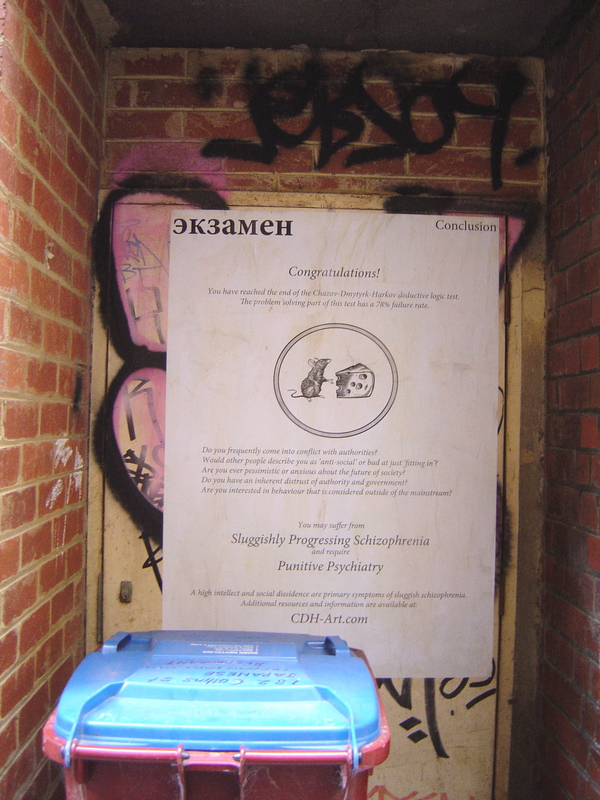 Puzzles and games require some kind of visual design element to assist comprehension and the mood, although some might find this particular game’s downbeat mood of Soviet psychiatry and rats rather dispiriting. You are the rat and you have to get to the cheese. These are not easy puzzles to solve; they require both mathematical, logic and spatial/map reading intelligence. It took me an hour and a half; I had to backtrack a couple of times when I realized that I hadn’t solved the puzzle.